I do some of my best thinking when I am in the parlor milking cows. In high school, I memorized answers for my history tests, figured out what to write for that English paper and recited speeches. Since coming home from college for the summer, I have had the chance to do quite a bit of milking, and therefore, quite a bit of thinking. Most recently, I have been reflecting on my year as Princess Kay, while looking ahead to June Dairy Month. In May, I spent a couple of days welcoming hundreds of grade school students to the Urban Ag Day held at the Minnesota State Fairgrounds. I spoke to them about the steps of milk from the cow to the store, and dairy’s nutritional value before sending them on their way to explore many different aspects of agriculture. I also spent a weekend at the Dairy Princess Promotion and Leadership Event where I had the chance to meet almost 70 dairy princesses from all over Minnesota, and enjoy valuable sessions focused on leadership and dairy-related topics ranging from nutrition messaging for dairy to classroom visits. I finished the month by attending a Fuel Up to Play 60 Smoothie Night for middle school students to celebrate the end of the school year and learn a little bit about farming and refueling with dairy. I am looking forward to a busy summer attending many breakfast on the farms, county fairs, dairy days, nursing homes, community events and parades. I hope that you have the chance to visit some of these activities, too. June Dairy Month provides us all with added opportunities to start the conversation about dairy. I have five tips for promoting dairy this summer. Share your story. Every farm has a different history, and every person has a different set of experiences. Consumers want to be able to make a personal connection with where their food comes from. They want to know what your farm is like, or what your connection to dairy is. Consumers want to see that you are authentic, real and transparent. This can be done by finding a shared value and sharing your personal experiences. This will help to build trust and consumer confidence in dairy. Seize every opportunity presented. You don’t have to be giving a tour of your farm or attending an event such as a breakfast on the farm to share your story. While these are both great opportunities to do so, don’t limit your conversations about dairy to only these occasions. The grocery store aisle, the county fair, a baseball game or a backyard BBQ can all be occasions to talk about dairy. Be approachable. The more approachable you seem, the more likely someone will be to ask their question. For example, if you see someone watching as you milk your cow at the county fair, take time to explain what you are doing, and ask if they have any questions. Greet people with a smile and make it obvious that you are willing to have a conversation with them or answer their questions. Ask questions and work in key messages. It can sometimes be challenging to know what aspect of dairy to talk about. During your conversations, try to figure out what aspect of dairy might be important to the consumer by asking questions. As the conversation continues, work in key messages such as “Dairy farmers care for their cows and the land,” or “Dairy foods are wholesome, safe and nutritious.” You should try to focus on including at least one key message in each conversation you have. The wording of key messages can vary, depending on who you are having the conversation with. Use your resources. If you are thinking about having a farm tour, bringing chocolate milk for your kid’s sports team or sampling dairy foods in your local grocery store, don’t forget to use your resources. 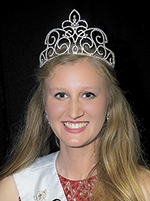 Invite your county dairy princesses to be a part of your event. Midwestdairy.com also has resources to enhance your event. Dairy-related coloring books, stickers, recipe cards and posters are just a few of the items that dairy farmers can use. I hope you all have a safe and productive June Dairy Month. Have fun sharing your dairy story throughout the summer, and don’t forget to enjoy plenty of ice cream along the way.